Besides a powder day, you couldn't ask for much better than this. Thinking about dabbling in the backcountry and checking out this alpine touring business that's so hot right now? 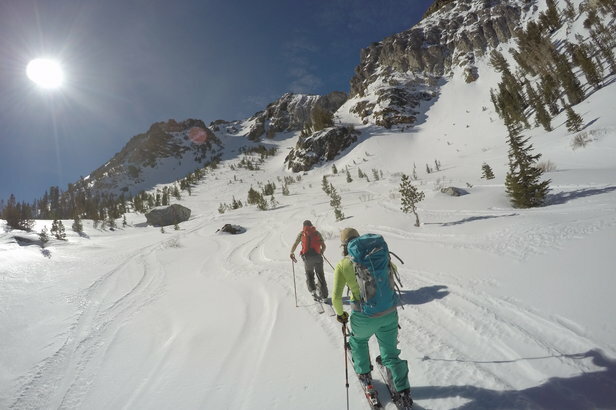 We had the chance to go out with Howie Schwartz of Sierra Mountain Guides into the June Mountain backcountry just outside of Mammoth. In addition to learning how to use a beacon, apply skins, adjust a touring binding to various heights and probe for warm ham (what a buried body feels like), I also picked up these useful tidbits that may be obvious to everyone but me. 1. Short strides: Sure, long glides are more efficient when you're on flatter terrain, but as it steepens, you're just fighting gravity trying to pull more weight further. Shorten up those glides and you'll not only have a better chance of keeping up with your guide, you'll be able to change directions much more efficiently. 1.5 Stop trying to keep up with your guide. 2. Embrace the counterintuitive: Contrary to almost everything you've beaten into your brain as the proper stance on skis, simply do the opposite. No big deal. That means leaning back, trusting the skin and binding, and rolling ankles down so skis are flush with the fall line. It helps if you focus on weighting a straight back leg while moving the other one forward and even gives your gams a bit of a rest between glides. As for the ankle roll, the alternative is sliding downhill on your edges, so you'll get the hang of it or you'll get nowhere. Stomping and flattening your ski into the skin track also seemed to help... everyone else. 3. Don't be a junk show; pack your bag thoughtfully: Taking everything out of your backpack each time you want a sip of water isn't ideal for anyone. Think about your order of operations and stuff accordingly. 3.5 Don't lose supplies, especially if they're not yours (sorry, Howie). 4. Practice backcountry serenity: Letting your nerves get the best of you or getting caught up in skiing steep powder lines happens, but you'll regret it if you don't chill out to take in nature's peaceful splendor at least once. That's more than half the point of being out there in the first place. 5. Listen to your guide, try to follow directions and short of that, do as they do: Howie was as patient as they come, especially in moments when the role of guide bled a bit too far into babysitter territory (see junk show). Minus a couple of "ski one at a time" fails on my part (When do I go? How about now? ), following his lead kept us safe and that much savvier in the backcountry. 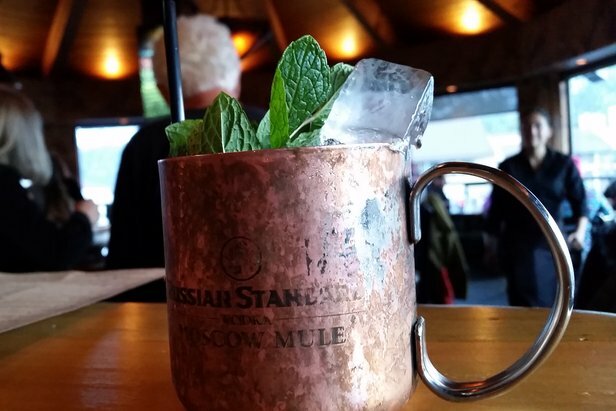 Sips and eats not to be missed at Mammoth.